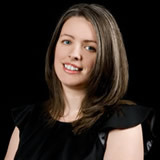 Emma Newman was born in a coastal village in southwest England and currently lives in Somerset (UK). After graduating from Oxford University came stints in magazine publishing, website information architecture, and teaching. More information about her can be found at her blog Post-Apocalyptic publishing at www.enewman.co.uk. Her first novel, 20 Years Later, was published in November 2011 under the byline EJ Newman from Dystopia Press. The author lives in Somerset, England. 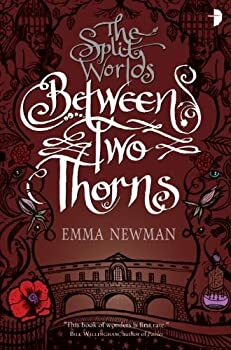 Between Two Thorns is the first book in Emma Newman’s SPLIT WORLDS series set in Bath, England where some humans live in a secret world called Aquae Sulis (aka "the Nether") that’s parallel to Mundanis, the “Mundane” world we know. The people who live in the Nether keep themselves hidden from us and shun modern dress, manners and technology. 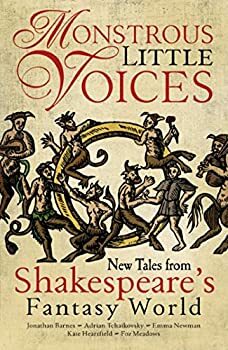 Their society is just like early 19th century English society except that they are influenced by their fae House Lords and are also under the authority of the Arbiters who police their use of magic. 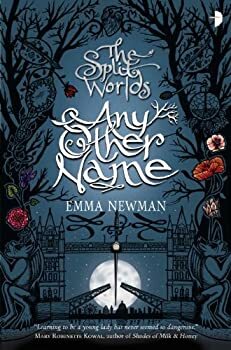 I didn’t enjoy Between Two Thorns, the first book in Emma Newman’s SPLIT WORLDS series because I didn’t like the characters, felt a little lost in the world, and thought the plot was boring. However, at the end of that novel things started to improve and since I already had the second book, Any Other Name, loaded into my phone (Brilliance Audio sent me review copies), I listened to it. Note: You really must read the first two books before coming to book three or you’ll be hopelessly lost. I’ll assume you’ve done that if you’re reading this review, so expect spoilers for those previous books. 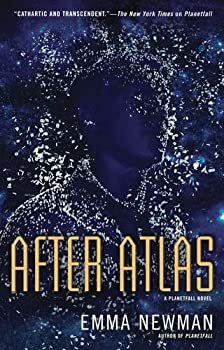 Emma Newman’s After Atlas (2016) is the pseudo-sequel to her first sci-fi offering, Planetfall (2015). 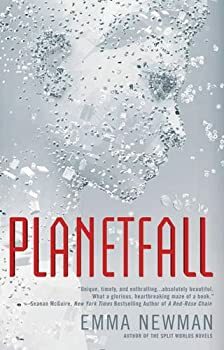 As Kat explained in her review, Planetfall is about a colony of humans who left Earth to follow Suh, an alleged prophet who received a supernatural message giving her the coordinates of an unknown distant planet where she was supposed to travel to receive instructions about God’s plans for humanity. After Atlas takes place on Earth, almost 40 years after the ship left. No word has come from the colonists, but the world awaits the opening of a time capsule left behind by the crew. 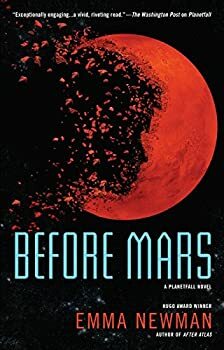 Emma Newman has done it again with her third PLANETFALL novel, Before Mars (2018). I ignored my usual daily reading goals and limits, I ignored a growing stack of paperwork, and I even ignored dinner because I was far more invested in Dr. Anna Kubrin’s declining mental state. What other reason could there be for her growing distance from reality? Why else would she be convinced that something nefarious is going on at her tiny, isolated Mars research station, when the other four scientists-in-residence and the station’s AI insist that everything is copacetic? 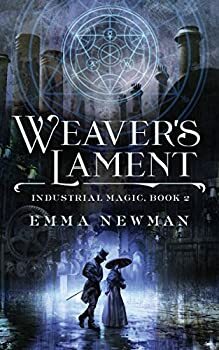 Weaver’s Lament (2017) is Emma Newman’s second novella in her INDUSTRIAL MAGIC series. The first one is Brother’s Ruin. 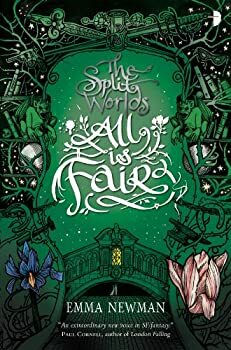 Both stories feature Charlotte Gunn, a young woman from a respectable family who is hiding several secrets; she is secretly an illustrator of popular fiction and she is secretly magical, having clandestine meetings with a magus to learn to control her abilities. In the first story, Charlotte used her abilities to enhance her older brother’s lesser skill and get him accepted into the Royal Society (who pays the family of nascent magi a pretty penny). From Dark Places — (2010) Publisher: Abby finds a creative solution to her father’s problems. Ben makes a pact with the Devil for a new Mum. Katie is pursued by unrelenting voices. John just found his colleague’s hand in a strange girl’s lap. Jarvis is falling apart on his wedding day. Rosalind comes face-to-face with her number one fan. And that is just the beginning. E.J. Newman’s debut anthology is a dark and twisting journey across the urban landscape, mining the rich seam of human frailties with insight and humour. The stories traverse the magical and the mundane, where supernatural beings are indistinguishable from their mortal counterparts in their complexity and complicity. 20 Years Later — (2011) Publisher: LONDON, 2012: It arrives and with that the world is changed into an unending graveyard littered with the bones, wreckage, and memories of a dead past, gone forever. LONDON, 2032: Twenty years later, out of the ashes, a new world begins to rise, a place ruled by both loyalty and fear, and where the quest to be the first to regain lost knowledge is an ongoing battle for power. A place where laws are made and enforced by roving gangs-the Bloomsbury Boys, the Gardners, the Red Lady’s Gang-who rule the streets and will do anything to protect their own. THE FOUR: Zane, Titus, Erin, Eve. Living in this new world, they discover that they have abilities never before seen. And little do they know that as they search post-apocalyptic London for Titus’ kidnapped sister that they’ll uncover the secret of It, and bring about a reckoning with the forces that almost destroyed all of humanity. CLICK HERE FOR MORE BY EMMA NEWMAN.